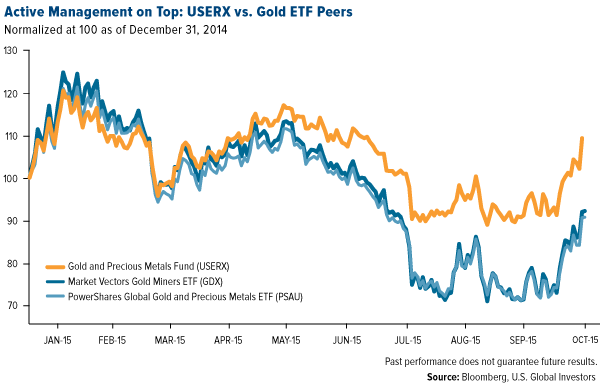 Will Gold Finish 2015 with a Gain? After its stellar performance last week, gold might do something it hasn’t done since 2012—that is, end the year in positive territory. You can see past returns for yourself in our perennially popular Periodic Table of Commodities Return. Responding to a weaker U.S. dollar, continued contraction in global growth and wide speculation that interest rates will stay near-zero for the remainder of the year, the yellow metal broke above its 200-day moving average and is close to erasing its 2015 losses. This could be the price reversal many gold bulls have been expecting. Back in August I shared with you that legendary hedge fund manager Stanley Druckenmiller, who’s made some mythic calls over his long career, invested $323 million of his own money in gold, now the largest position in his family funds. Although such a large weighting isn’t appropriate for all investors—I’ve always recommended 10 percent in gold: 5 percent in gold stocks, 5 percent in bullion—it looks as if Druckenmiller made another good call. The big news last week was that Walmart took a massive hit after the retail giant said it expected a profit slump in 2016. Walmart investors lost a whopping $24 billion—$21 billion on Wednesday alone. While this news dominated the headlines, it’s important to recognize that the total amount of net assets in the SPDR Gold Trust, the world’s largest gold-backed ETF, is just slightly more than Walmart’s one-week loss. It’s no mere coincidence that gold’s breakout coincides with the weakening of the U.S. dollar last week. 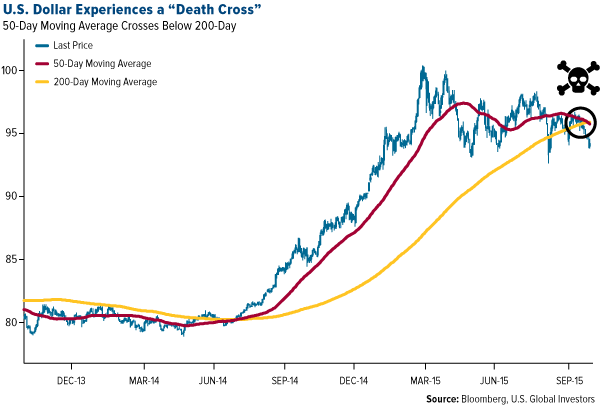 The greenback signaled what’s known as a “death cross,” just in time for Halloween. 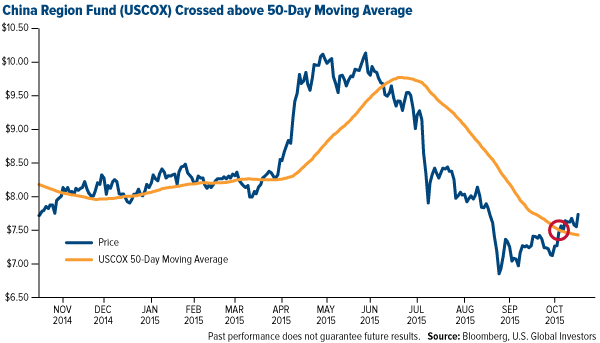 Widely recognized as the start of a bearish trend, a death cross occurs when the 50-day moving average crosses below the 200-day. This hasn’t happened since September 2013. As ominous as this sounds, it’s good news for gold and other metals and commodities, not to mention emerging markets and American exports. For the past year, the strong dollar has crushed these assets, something I write and speak about frequently. If the death cross does indeed indicate the start of a downward trend, gold might have the breathing room it needs to reach the important $1,200 resistance level. 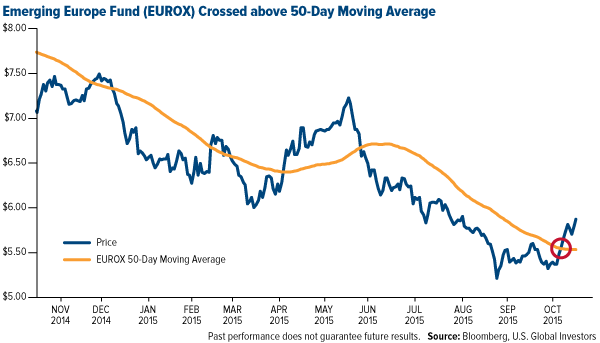 Our China Region Fund (USCOX) and Emerging Europe Fund (EUROX) have responded well to the dollar’s drop, both of them crossing above their 50-day moving averages. When we factor in the Love Trade, gold has even further upside potential. In India, the world’s largest consumer of the precious metal, the annual wedding and fall festival season has officially begun, which has historically triggered a spike in demand. 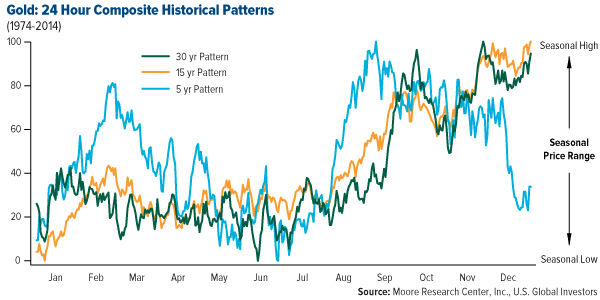 This period is followed by Christmas and the Chinese New Year in February, when gold prices have surged, based on the shorter-term, five-year pattern. 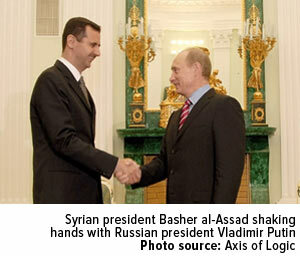 Gold has also likely benefited in the short term by the Fear Trade, specifically global geopolitical events such as Russia’s involvement in Syria. We should never welcome war, but the truth is that political turmoil very often has had a positive effect on commodity prices and currencies. Both the Russian ruble and Brent oil are currently above their 50-day moving averages. Speaking of Marin, his Katusa Research and Cambridge House International will be co-producing the Silver Summit and Resource Expo in San Francisco November 23 and 24. I’ll be giving the opening keynote address. If you’d like to attend the conference as my guest, send me an email for a complimentary registration. The Fear Trade also includes monetary and fiscal policies such as money supply and real interest rates. As opposed to geopolitical events, which might have an immediate effect on gold, these drivers can have a long-term influence. As a reminder, real interest rates are what you get when you deduct the rate of inflation from the 10-year Treasury yield. For example, if Treasury yields were at 2 percent and inflation was also at 2 percent, you wouldn’t really be earning anything. But if inflation was at 3 percent, you’d be experiencing a negative real rate. When gold hit its all-time high of $1,900 per ounce in August 2011, real interest rates were sitting at -3 percent. In other words, if you bought the 10-year, you essentially lost 3 percent a year on your “safe” Treasury investment. Since gold doesn’t cost anything to hold, it became more attractive and the metal’s price soared. Today, the U.S. has virtually no inflation, so real interest rates are at 2 percent, a swing of 500 basis points since August 2011. 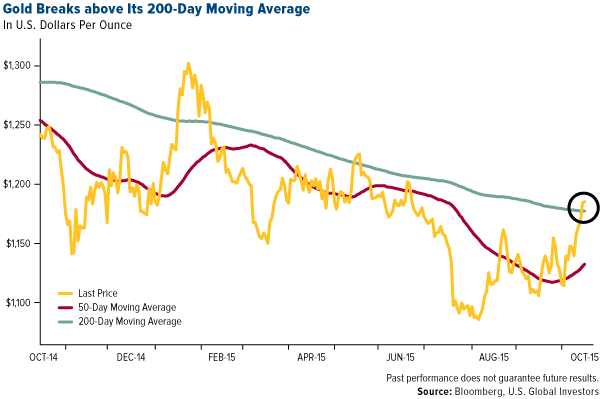 This has lately had a negative effect on gold, which means it’s even more remarkable that the precious metal has broken above its 200-day moving average. Our office was visited last week by Barry Bannister, CFA, the chief equity strategist for investment firm Stifel, who gave us buckets of useful macroeconomic research, much of which validated what we’ve been saying for a long time regarding the relationship between the price of gold and real interest rates. Gold’s rally last week occurred in spite of this “invisible” rate hike. Even with gold prices off around 38 percent since the August 2011 high, our Gold and Precious Metals Fund (USERX) has done well, outperforming the Market Vectors Gold Miners ETF (GDX) and PowerShares Global Gold & Precious Metals ETF (PSAU). Speaking to Investor’s Business Daily, portfolio manager Ralph Aldis pointed out that one of the reasons why our fund has outperformed is because we’re able to apply our tacit knowledge of company executives and management teams, as well as anticipate and act on political risks in countries we invest in. This is a skill (and benefit) that only active management can provide. “They end up owning the biggest companies, which because of their size have difficulty growing,” Ralph told IBD. Klondex Mines is one such success story. It’s the fund’s top weighting, at 17 percent—and yet because of its market-cap, it isn’t included at all in the two ETFs. As Ralph told The Gold Report last week, “I want to own companies where management can increase the value proposition,” regardless of gold prices. 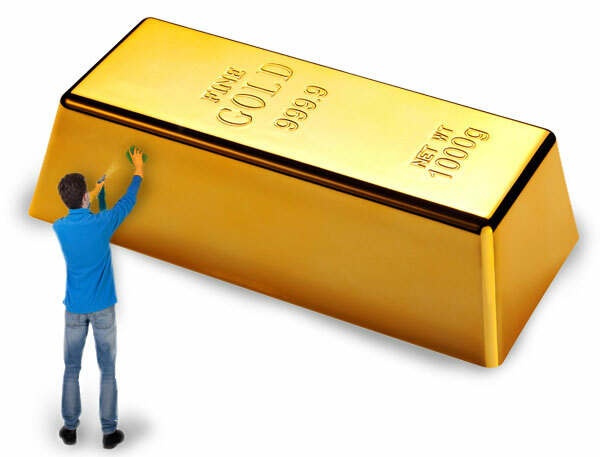 Previous Article LBMA conference feedback – far from optimistic for gold!